Our morning at the Sama Badia Association in Mafraq, like so many of my days with CWB over the past 12 years, was full of “known unknowns” and even some “unknowns unknowns”. There was unexpected coach education, help from two national football team women, a biblical sand storm and torrential rain and flooding (which caused our afternoon session to be cancelled) and a planning for the future session with the UNHCR at their offices. It was our third trip out to Mafraq in 4 days to work with both the UNHCR and Right to Play. Again, we divided up our coaching resources. Lee, Sara and Jamie went to work with UNHCR selected volunteers to teach them to be coaches and myself, Zubair (Dr Sabir) and Jules went to the Sama Badia Association to work with Syrian children. The Sama Badia association was located in the suburbs of Mafraq. It has a dedicated team of teachers and helpers and offers extra tuition and support to Syrian boys. There is a calm and lovely manner to the place. Currently, due to resource issues, Syrian school children are only taught in the afternoon and often only for a couple of hours. From having had regular school days to two hours a day is a significant drop and creates many problems both in the short-term (quality of education) and also in the long term (social exclusion). Expecting a simple coaching kids session, it was a surprise to be told by Hazem of Right to Play that the children were just there for the new coaches to teach. Dusting off my coach education skills of yester year (last time was 2012 and before that 2009) I got straight into it. 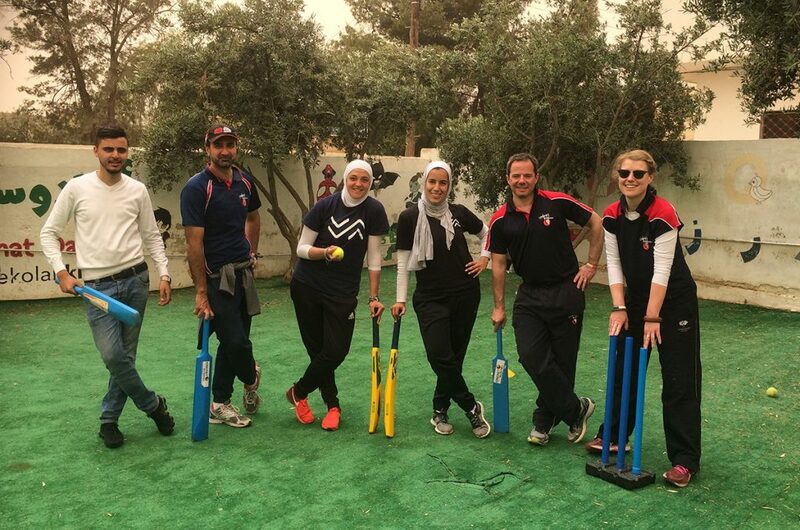 Aided by the excellent Yasneen and Haneen (Jordanian footballers) and between several hail storms, we taught how to coach the basics, as well as some fun games for the kids. This culminated in ending with a game of pairs cricket. Given that no-one had ever bowled a ball two hours before, there were straight arms, leg slide flicks and cover drives a plenty. I was utterly enthused by the experience of teaching cricket again, as well as how they all came on. But no sooner had we finished then the sky turned to an orange hue. It looked like a large sand storm was about to envelop us. No sooner had we jumped into the car then the heavens opened with what we understand was one of the largest rain storms in Jordanian history. Roads (and indeed shops) were flooded in a matter of minutes. Jordanian driving, erratic in dry conditions, became insane (particularly in a world without traffic lights). It suddenly made sense why we had been told moments before that our afternoon session in Irbid had been cancelled. Surely the only time that rain had stopped play in Jordan. Our final duty of the day was to meet at the UNHCR offices, where newly arriving refugees fleeing the civil war in Syria are registered. 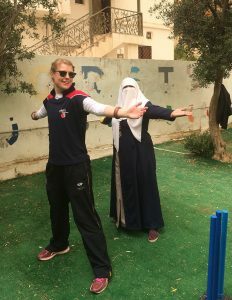 For me having helped found CWB it was a big moment to finally be talking to a UN agency about ways in which we could work together in the future to put smiles on the faces of the refugees and Jordanians as well as encouraging girls confidence by getting them to play sport. We shall be back Mafraq. We shall be back.